Don't confuse this triangular shaped craft as a UFO. It is identified as the X-47B. It's a drone! This means it is without a human pilot inside the cockpit. What is even more amazing, is that unlike drones of the past that were flown by humans using a remote control, the X-47B is autonomous! It's flying itself. Yesterday afternoon, the super drone successfully responded to a computer command. It launched itself from a land-based catapult at the Navy test facility in Maryland. A catapult launch is used on aircraft carriers. The catapult literally launches an aircraft to give it an extra push as it's taking off. Now that the land-based catapult test has done very well, the next test is for the X-47B to catapult launch and land on a carrier. The test looks scheduled for sometime this spring or summer. 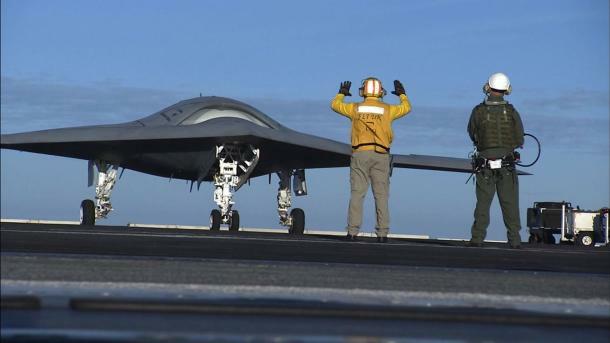 Right now the X-47B is supposedly unarmed, but the future as many possibilities for the robot soldier in the making. The drone could be used for surveillance, jamming of enemy air defenses, transporting weapons or one day just flat out be part of an army an Iron Man robots to help defend our country. Ok, my imagination might of ran away with me a little bit there, but that's the future I like to picture for the X-47B. It would save a lot of lives. Once again, this is not a UFO. If you see a dark triangular shape flying through the air, look for it's very visible landing gear and plane lights that blink. It also makes a jet engine noise. If it's missing these elements and hovering, than...it might be an extraterrestrial UFO!